It had been a long time since I'd had the opportunity to go on a good thrifting trip, but that day that I visited Yarns, Etc., I noticed, whilst walking up to the building, that there was a thrift shop a couple doors down. I made a mental note to stop by after I was done with the yarns, and thrifted, I did! I actually got to hit up another thrift shop just the next day, so my collection of finds are in this post. but I just loved the turquoise flowers on top. I originally checked out leaving this pretty dish sitting in the store's front window, but had to go back inside to get her. Then, I talked the nice lady behind the counter into discounting the dish a couple bucks because or some cracks and chips. Woohoo! Then, there was this cute bread "basket" with a tile you can heat up to keep your breads warm during dinner. I thought it was super cute and all vintage-y...in fact, it looked like someone made it by hand and it even had some nails that were coming undone...buuuutttt, then I noticed the "Made in Japan" sticker. lol...not so handmade after all, eh? There was a whole stash of Southern Living Christmas Books starting in the 80's till present. I couldn't get the whole collection, so I got the compiled book and one from 2006 that had some cool projects. I found these vintage postcards for a mere 50 cents. They are still in their original wrapping! I'm not sure I can bear to open them! ...and this embroidered poinsettia tablecloth/napkin set and set of holly-embroidered cocktail napkins. The cloth goodies are a wee bit stained and even had a note "Soak Me" on them when I bought them. Anyone have any good tips on getting stains out of delicate materials? Anywho, as you can see, I had quite the thrifting adventure recently...hopefully, I'll have the chance to go thrifting again very soon! One of my good friends recently had to downsize her space - from sharing a townhome with a friend to just renting out a room. She decided to get rid of some of her stuff by setting up a booth at the flea market. I went along to help and set up one table next to her with some stuff I wanted to get rid of as well as some of my handmade jewelry. Of course, being at a flea market, I didn't sell any jewelry, but we did have some fun times. I, also, had the good fortune of deciding to peruse through her boxes of "junk" to see what she was getting rid of. 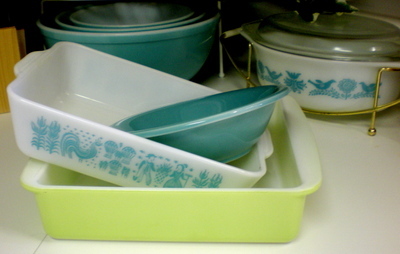 Would you know I found two vintage pyrex in nearly pristine condition? The lids were missing sure, but details, details. Who cares? I love them anyways. I had to pick up the turquoise bowl, too. I have to say, these new goodies are great additions to my slowly growing pyrex collection. Yippee! As a side note, if you've been wondering where I've run off to, I've just been playing catch up from post-wedding stuff. My house is a wreck and all the clutter is really leaving me feeling like I never have time...like I always have something to do. I figured out the other day that the clutter is making me feel like I always have something to do b/c I do - I always have clutter to clean. I'm trying to cut back on blogging and crafting for a bit so I can get my life in order. In addition to that, I got my wisdom teeth out last Friday. I was really freaked out about the whole thing - especially about the IV sedation anesthesia I had selected b/c the procedure was making me so nervous I didn't think I could be awake. You know, I had four teeth pulled when I was in high school...FOUR! And, I didn't think anything of it at the time. I swear, the older I get, the more "chicken" I get. I mean, the two wisdom teeth the dude wanted to take out were two that had grown out of the gum. Basically, I was getting two teeth pulled. Not sure what freaked me out so much, but I'm glad it's over! :) Now, I'm just looking forward to having a "solid" meal...lol. Hope you're all doing well! I hope to be able to post at least a couple more blog-posts than I have been doing as of late. Wish me luck! Inspired by the amazing finds over at Artsy Craftsy Babe recently, I decided to go thrifting last week. I haven't had the best luck with my local thrift shops, but I keep hope up that I will find something amazing every time I go and every once in awhile I get lucky...although, usually, I don't find much...especially in the way of linens. Where are all the fab vintage linens I see other people thrifting all the time? As I expected, I didn't find nearly as many awesome finds as she did, but I did score two really cool vintage pillowcases in pretty darn good condition. When taking these photos, I noticed a small hole in one of the pillowcase sides, but hey, I'm not complaining. I also found a pretty cool flat sheet with a light-toned, yet adorable pattern. 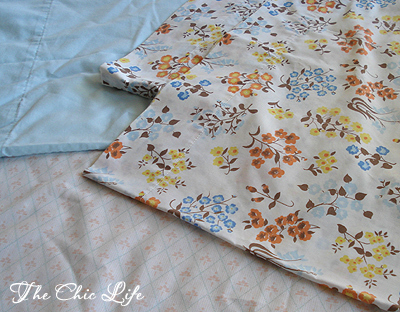 I also found a long light blue pillowcase that, amazingly, coordinated with the vintage ones with the cute flowers. 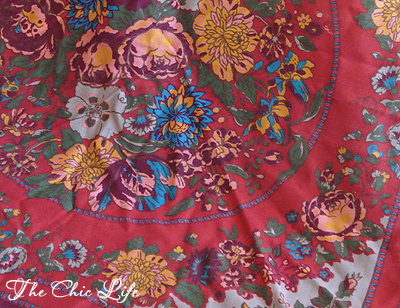 I also found this beautiful, red table cloth. It looks kinda vintage, but It's Laura Ashley. Can Laura Ashley be vintage? Not sure...but, I do know it's really pretty! I'm not sure what kind of food to cook with this. It almost makes me think Mexican...or a good steak and potatoes meal. What do you think? What kind of food would you expect to be served on this table cloth?